The spotlight has been placed on train crossing safety in North Carolina (NC) due to their ranking as one of the top areas for train crossing collisions, according to the Federal Railroad Administration Statistics. The North Carolina Department of Transportation (NCDOT) is revising their safety guidelines for rail crossings. This is necessary considering 69 car-train crossing collisions took place in the Tar Heel State ranking it 12th out of the top-15 states for such collisions. "We'll see if we need to enhance signs or update pavement markings to make them bolder and more visible," said Paul Worley, the director of engineering and safety for NCDOT. "In addition, we'll look at revisions in the geometric design of the flashers in some places. I recommend they review the timing, design and enforcement of the rail crossing bars which drop down once a train is approaching a rail crossing. Some of these fatal train crashes featured vehicles getting stuck between the bars without any maneuverability to get out due to traffic congestion on both sides. 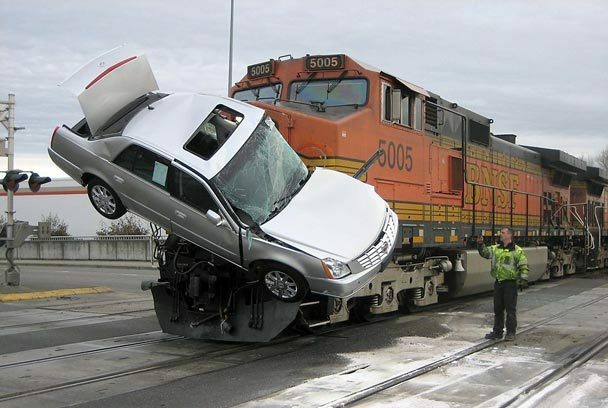 In 2008, there were 2,391 rail crossing collisions in the United States with 64 percent of those collisions taking place in the top-15 states. We can do better than this. We need to do better than this. Always keep in mind that small children, mothers, fathers, brothers, and sisters lost their lives in these senseless collisions.